The AR3T Pilot Funding Program supports researchers in the development of innovative, interdisciplinary Regenerative Rehabilitation research projects. AR3T is not accepting new pilot grant proposals at this time. Overview: Stem cells interpret mechanical forces in a broad spectrum of ways that can affect their behavior and, ultimately, their ability to drive tissue regeneration. AR3T is looking to support researchers who propose interdisciplinary approaches combining regenerative medicine with mechanical stimulation, with the aim of optimizing outcomes. 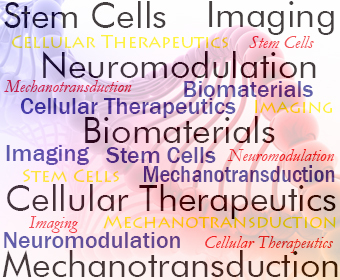 The Regenerative Rehabilitation research community is benefiting from the development of novel lines of research that incorporate methods utilizing electrical or mechanical stimulation of stem cells, applied biophysics and/or tissue engineering approaches, and assessing stem cell behavior and/or functional outcomes. A proposed project must include both a regenerative medicine/stem cell biology component as well as a rehabilitative/mechanotransductive component. Contact ar3t@pitt.edu if you would be interested in forming a collaboration with an AR3T researcher on a proposal. Eligible Individuals: The AR3T pilot funding program is open to junior investigators and mid-level career faculty. The Principal Investigator (PI) should have a doctoral degree in a relevant field and be employed at an nonprofit institution within the United States. The goal is to fund researchers who are interested in beginning a career in Regenerative Rehabilitation research or who would like to start a new line of research in this area. We are not currently accepting pilot grant proposals. Subscribe to the AR3T newsletter in order to receive the latest news on research and grant opportunities for Regenerative Rehabilitation researchers. For questions and/or assistance with proposal development, contact us at ar3t@pitt.edu.